When I told my friend Fanny from Italy that we would be driving an RV around California, she expected to be driving a small car and not a fully fledged mobile home. For her RV meant Rental Vehicle and once we turned up at the pick up site in Cordelia, I could see her excitement and fear of what we would refer to as ‘The Beast’. At more than 10 meters length (sorry I still can’t get my head around Imperial) this vehicle is by no means a regular car. The RV was covered with Mighway’s beautiful and quirky branding, which definitely stood out from amongst the hundred other RV’s parked on the premises. Mighway is a relatively new company originally from New Zealand that aims to be the AirBnB of RV’s and mobile homes. The way it works is that owners can hand over their RV’s to Mighway to be rented out through their website. 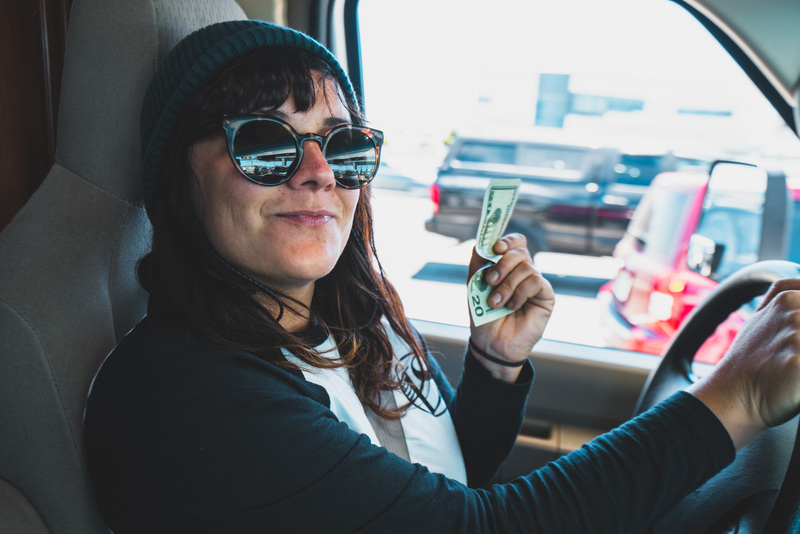 The RV gets to be driven around and the owner can get some extra cash for a vehicle they might only use once a year. It was roughly 3 months ago when I applied to blog for Mighway after finding an advert on travelmassive.com. I didn’t know how to drive and was still in Thailand when I wrote to them and didn’t think much of it. But three days later I got an email from Sonia that I had be chosen to tour the US for free on one of their RV’s. I couldn’t believe what had just happened and mentioned the small but crucial detail that I don’t have a driver’s license, but I quickly found a solution by asking my University friend Fanny if she would like to drive for me instead. “YEEEESSS!” Was her reply and skip ahead three months later, here we were. “Have you ever driven an RV before?” Aldie the vehicle manager asked. “Um not really” Fanny replied hesitantly. “Alright then let’s start with the generator.” Whilst Aldie showed us around the vehicle, I couldn’t help but wonder that I had made it this far from Thailand, over China and then the cargo ship to Canada and bus to San Francisco. It all seemed so surreal “Like a movie”- I kept telling myself the moment I stepped on North American soil.